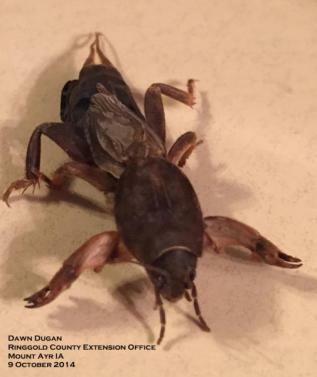 One of the less common accidental invaders found inside houses and buildings in Iowa is also one of the most appropriately named insects, the mole cricket. These distinctive insects very closely resemble the common, lawn burrowing moles with their large, spade-like front legs. As the name implies, mole crickets live underground in burrows. Mole crickets are brown and about 1 1/4 inch long. They are covered with fine hair and have a soft, satin appearance. Their short antennae are barely noticeable, but they have two long cerci (stout thread-like appendages) that extend out from under the wings at the tail end. The hind legs of mole crickets are vaguely cricket- or grasshopper-like with only slightly enlarged femurs. The tibia of the front legs however, are greatly enlarged and the first segment of the front tarsi is broad, spadelike and equipped with four prominent, stout teeth. Mole crickets are not pests in Iowa. Many books refer to the mole crickets as pests of turfgrass, but significant damage is limited to the southern United States from North Carolina to the Gulf coast of Texas. Mole crickets do feed on grass roots, but damage to turfgrass, especially golf course greens comes from the tunneling that tears plants from the ground and pushes mounds of soil onto the turf surface. Subsurface tunneling by a few mole crickets in Iowa should be considered beneficial as the tunnels loosen the soil and improve soil drainage and aeration. Mole crickets are active at night and occasionally wander into houses and other buildings by accident. They are completely harmless indoors, as they cannot bite or sting, and they do not feed on fabric, paper or house structures. The only necessary action is to pick or sweep up the occasional invader and return them to outdoors. In case of persistent invasion, it may be necessary to seal or caulk cracks, gaps and other openings that serve as passageways into the house for mole crickets and other occasional invaders.